Incurring damage on your yacht is painful enough  filing an insurance claim shouldnt add to the discomfort. Boat International has asked an expert to explain the ins and outs of superyacht insurance claims, thus ensuring that if the worst case scenario should happen and a claim must be filed, the process will be as smooth and pain-free as possible. Boat International: What is the role of the broker, damage surveyor and underwriter in a claim? The broker receives the claim from the assured (the yacht owner) and represents their interests while also assisting them to best present their claim to the underwriters. The damage surveyor is an independent assessor of the damage, although he is normally appointed by the underwriters (more specifically, the leading underwriter) or the insurance broker with previous authorisation from the underwriters. He has the task of ascertaining the cause, nature and extent of damage and reporting this information back to the principals (the insurance company) as quickly and accurately as possible. He normally has a background as a marine engineer, a master mariner or a naval architect. Although the damage surveyor works for the insurance company he has the duty to provide an unbiased and independent assessment of the casualty. It is in the interest of the insurance company to make the claim experience as trouble free as possible for the yacht owner and provide the highest level of assistance following the incident. The addition of impartial, expert advice from the damage surveyor to all parties involved has the dual effect of assisting the yacht owner and adding value to the service provided by the insurance company. The lead underwriters review and approve the claim and then communicate their findings and the value of the claim to the following underwriters. In agreement with the former, they settle the claim. BI: What should a captain do in case damage occurs on a yacht?  Act as a prudent un-assured: i.e. if there was no insurance and the owners are faced with a large financial loss.  Take all steps to minimise the loss or damage, or any potential legal liability. They must act to safeguard the property insured.  Keep a log of events and gather evidence such as photographs, video, print-outs from your vessels electronic equipment, names of witnesses, draw diagrams and annotate marine charts.  Disclose to the insurance and damage surveyor the above information and evidence and cooperate fully. The surveyors role is to assist the assured/captain/owners and ease the pain of the experience of putting remedy to a casualty.  Send to the broker and the damage surveyor any communication received from any other person concerning the claim or damage.  In the case of theft, vandalism or other criminal activity, the captain must inform the police. BI: What should a captain definitely not do in case of damage? Stefano Scarpa: Without written consent of the broker and underwriter, the captain should never incur any expense in making good any loss or damage (other than to prevent further damage) or negotiate, pay, settle, admit or repudiate any claim to a third party. For any circumstances that could give to a claim against you under the third party legal liability (P&I) section of your insurance policy, you should follow the liability claims procedure. BI: Who does the owner/captain contact on event on damage? Stefano Scarpa: Contact their insurance broker  as soon as possible. BI: How much owner involvement is required in a claim? Stefano Scarpa: If the owners employ a professional captain and a yacht management company, the need for direct involvement from the owners in the claim should be minimal. However, many yacht owners want to be informed on the damage, status of repair and when they will be able to use or charter their yacht again. BI: Can the entire yacht insurance claim process be handled by the superyacht management company without the owner needing to be involved? Stefano Scarpa: From the owners side, yes, in theory. This is providing that their captain fully cooperates with the attending damage surveyor and the yacht manager and that the yachts manager is trained and experienced in handling insurance claims. BI: What should the owner and captain do in order to make a claim as painless as possible?  Where possible, ask for quotations from more than one repair yard (ideally three). Also, do not move the yacht to a yard for repair before having received at least a budget estimate cost and having it approved by the insurance and damage surveyor.  Promptly update the damage surveyor and the insurance broker on matters regarding the claim including, but not limited to, changes on: yacht movements, quotations from repair yards before commencement of work, proposed method of repair, work schedule, tests and commissioning (post repairs), costs, etc. Complying with the above should allow the yacht owner and his captain to take full advantage of the damage surveyor assistance to identify the best method of repair and the most suitable repair yard. The damage surveyor has extensive experience in repair yards and repair methods. Moreover, compliance with the above recommendations increases the likelihood that the claim is paid in full and with no delay. BI: Is there a claim limit? Stefano Scarpa: Yes, it is the limit of the yacht insurance covers. A yacht insurance generally includes a number of covers. Hull, third part liability, personal injury, tender and toys are just a few of them. 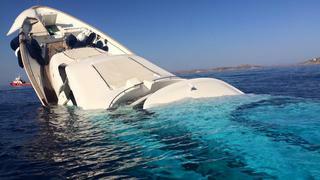 The limit for the hull cover is the insured value of the yacht in case of total loss, all the other covers have limits that can vary quite a lot depending from the insurance provider and the policy. BI: What are some insurance claims that have gone wrong  and why? Stefano Scarpa: Claims have gone wrong when information was not fully disclosed, which caused a claim payment to be delayed. In another scenario of a claim gone wrong, the owners insisted on using a yard that was not recommended by the surveyor and ended up with unsatisfactory repair and increased time at the yard. The end result was that the owner did not use their yacht for the entire summer! If the surveyor recommendation on yard and method of repair had been followed, the owner could have enjoyed his yacht for at least part of the summer. BI: When have claims worked smoothly? Stefano Scarpa: Simply put, claims that have gone most smoothly were cases in which the recommendations were fully complied with.